which ended up being a stupid phone. 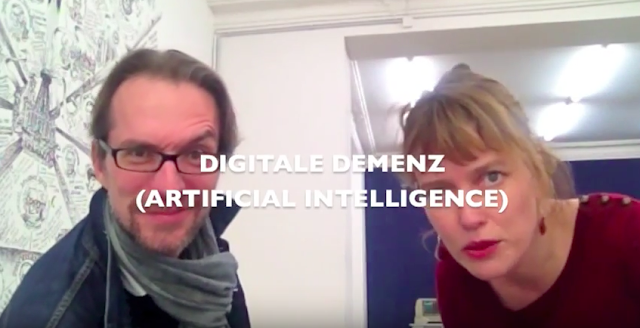 My favourite Berlin Art Week exhibition was the one curated by Thibaut de Ruyter at Eigen + Art Lab: Digitale Demenz (Artificial Intelligence). I'd seen Thibaut de Ruyter around before - I knew he's also a blogger, which is, of course, über-cool. I knew he's doing a new art magazine in Kazakhstan, which is also über-something. So, you see, I knew a bit, but I wanted to know more. So I asked Thibaut de Ruyter if I could interview him about this Best Exhibition of Fall 2015. And he agreed. Here is our talk - in essence it's about technology failing, and funnily enough, it was my own smartphone camera that let me down in the end. I included all the "behind the scenes", holding nothing back - you can have it all - 15 minutes and 29 seconds of Thibaut de Ruyter! PS: The exhibition at Eigen + Art Lab just finished, but don't despair - it will travel around Germany, so keep an eye out!